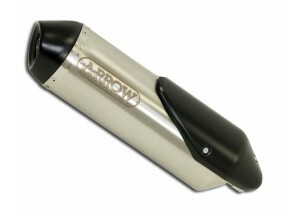 Reflex is the all-new exhaust system developed by Arrow. 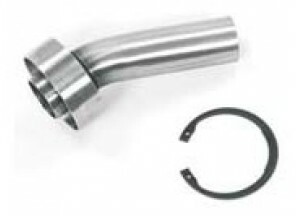 Designed to fit a wide range of engines (up to 30cc displacement and maybe more), Reflex systems are made with a stainless steel silencer and a stainless steel header, thus replacing the whole original exhaust. A Reflex system weights about 3.5kg and guarantess a huge weight reduction (about 3kg, depending on the vehicle) with respect to the original system. Race-Tech 2010 endcap, together with the smooth brushed surface finish, gives the Reflex silencer a unique style. Some tech tips: as told above Reflex systems are made in stainless steel alloy, ensuring weight reduction and high reliability. All-new design of interiors and dB-killer guarantees top performances and reduced noise levels: Reflex silencers have been heavily tested, replicating the same checks applied usually to original equipment systems. A formed plate and 3 welded fixing brackets ensure the perfect and easy fitment of Reflex silencers on the scooter. The anti-vibrating rubber mounts help in damping vibrations and shocks coming from the swingarm. Reflex exhaust systems will be soon (if not yet) available for a wide range of maxiscooters. Give a look to the list attached below. 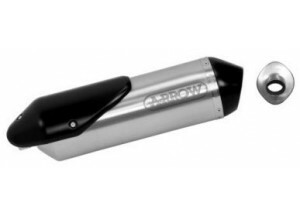 Reflex main features are: street legal - lightweight - Race-Tech 2010 stainless steel brushed silencer - laser-etched Arrow logo - top-level performances - low noise to meet EU standards - excellent reliability - easy-to-fit - quick-to-fit ... as it is ... an Arrow !